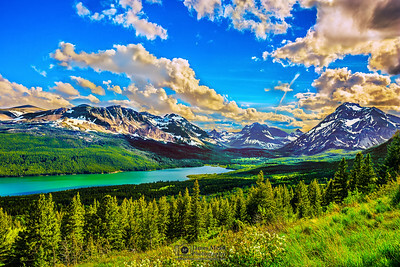 Rugged Mountains, Pristine Forests, Alpine Meadows, and spectacular Alpine Lakes. 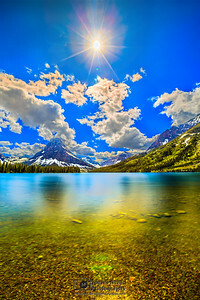 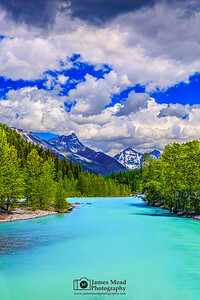 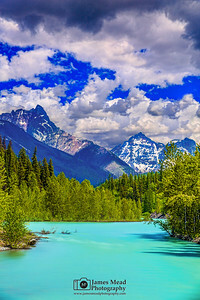 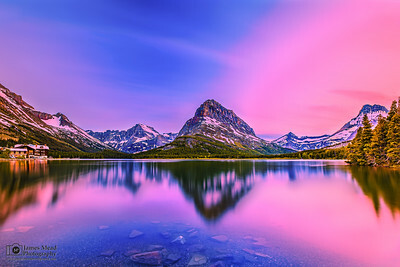 This is photography of Glacier National Park. 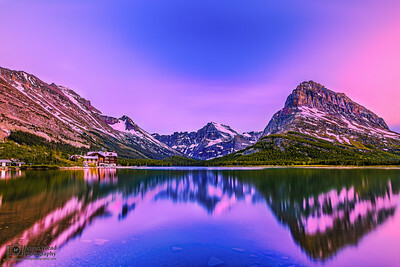 The setting sun casts a golden glow over (from left to right) The Head, Bison Mountain, Medicine Peak, Mount Henry, Appistoki Peak, Never Laughs Mountain, Painted Tepee Peak, Mount Rockwell, Mount Sinopah, Lone Walker Mountain and Rising Wolf Mountain as they rise high above Lower Two Medicine Lake in Glacier National Park. 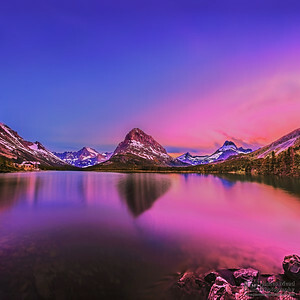 Alpenglow casts a pink glow off of (from left to right) Allen Mountain, Mount Siyeh, Cataract Mountain, Bishop's Cap, Mount Gould, Angel Wing, The Garden Wall, Mount Grinnel, Swiftcurrent Mountain, Mount Wilbur, and Iceberg Peak as they rise high above the waters of Swiftcurrent Lake. 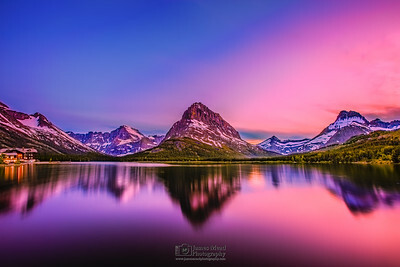 Eagle Plume Mountain, Mad Wolf Mountain, Kupunkamint Peak, White Calf Mountain and Divide Mountain (from left to right) rise high into the sky above the Cut Bank Valley in Glacier National Park as the setting sun casts a golden glow to the west. 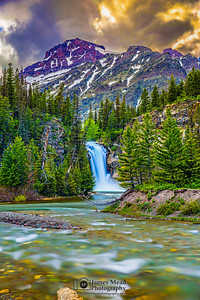 The Continental Divide cuts through Marias Pass in the Lewis Range of the Rocky Mountians in Northern Montana as Calf Robe Mountain, Elk Mountain, and Little Dog Mountain rise high into the sky. 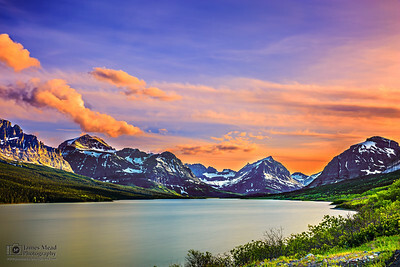 The sun sets over the waters of Sherburne Lake in Glacier National Park as Wynn Mountain, Mount Siyeh, Cataract Mountain, Allen Mountain, Bishops Cap, Mount Gloud, Angel Wing, Mount Grinnel, Altyn Peak, and Apikuni Mountain rise high above into the sky. 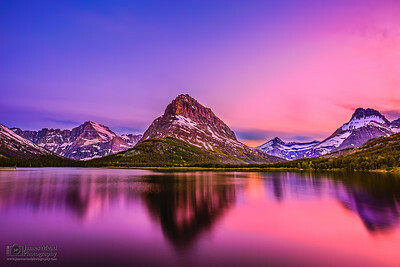 Mount Grinnel and Angel Wing rise high above the waters of Swiftcurrent Lake as Alpenglow sets in. 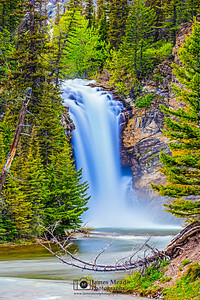 Running Eagle Falls (also know as Trick Falls) is a double waterfall resulting from two different water sources in Glacier National Park. 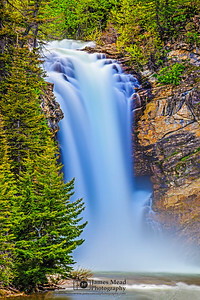 The falls form where the two water sources converge. 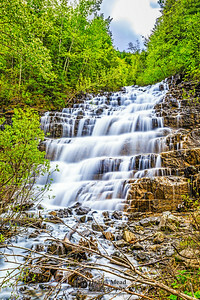 The 40 foot upper falls cascades over the 20 foot lower falls in the late spring during the snow melt. 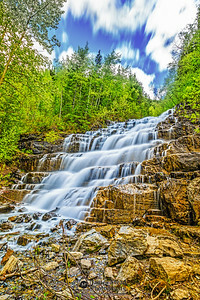 Silver Staircase Falls cascades 40 feet down the cliffs in Glacier National Park.